Originally published in English in 1971, structuralism was an increasingly important method of analysis in disciplines as diverse as mathematics, physics, biology, psychology, linguistics, sociology, anthropology and philosophy. 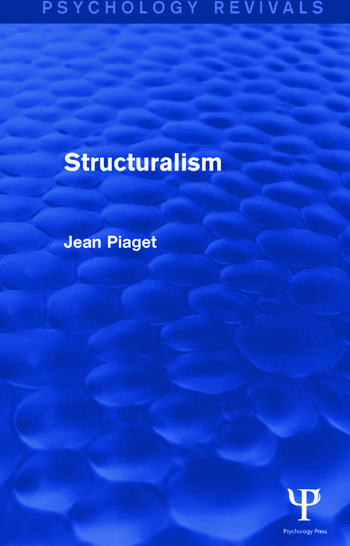 Piaget here offers both a definitive introduction to the method and a brilliant critique of the principal structuralist positions. He explains and evaluates the work of the main people at work in the field – Claude Lévi-Strauss, Michel Foucault, Talcott Parsons, Noam Chomsky – and concludes that structuralism has a rich and fruitful future ahead of it. An indispensable work for serious students and working scholars in almost every field, the book is also an important addition to Piaget’s life-long study of the relationship of language and thought. 1. Introduction and Location of Problems 2. Mathematical and Logical Structures 3. Physical and Biological Structures 4. Psychological Structures 5. Linguistic Structuralism 6. Structural Analysis in the Social Sciences 7. Structuralism and Philosophy. Conclusion. Selected Bibliography. Index.